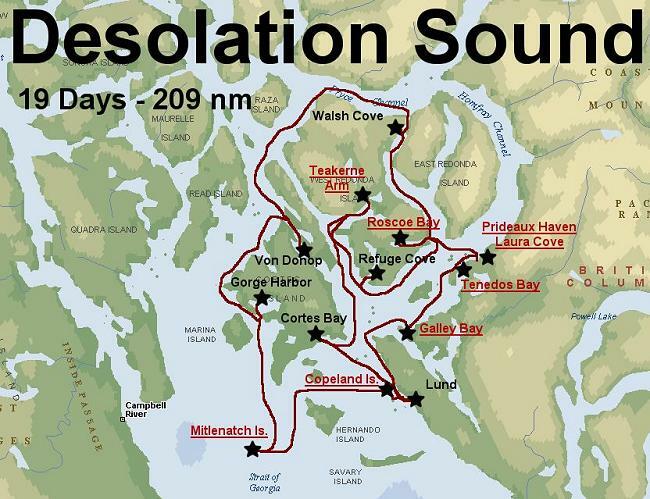 After I dropped off Eric and Sarah, I had a night alone in Lund before meeting my final crew for Desolation Sound. Hoyt and Heidi, friends from Seattle, were bringing their friends visiting from Holland - Burney and Saskia. At first I didn't know if 5 people on the boat would be too much. As it ended up, it was just fine. We had perfect weather so we didn't have to spend too much time below. Even when we did, there seemed to be plenty of room. They brought great food and drink and it was fun being on a multi-national boat in foreign waters. 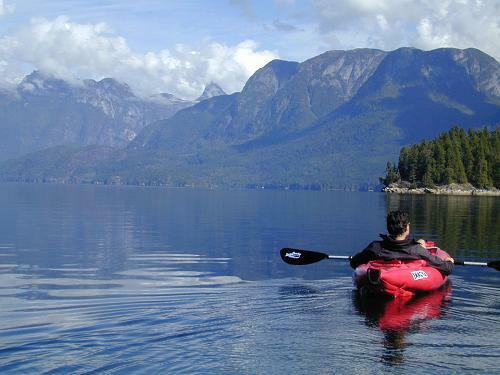 Here is a photo of Saskia kayaking in Prideaux Haven. The weather was stellar and I was very happy to be able to share the experience with my old friends from Seattle and my new friends from the Netherlands. 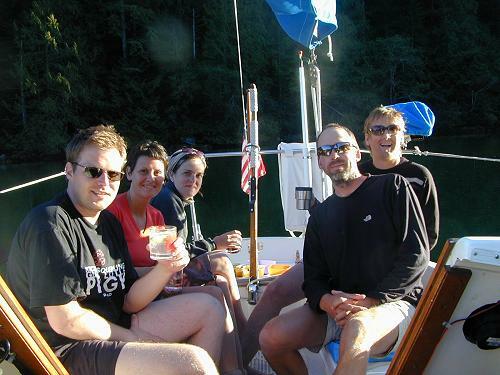 I took my new crew back to Roscoe Bay even though I had been there twice before. 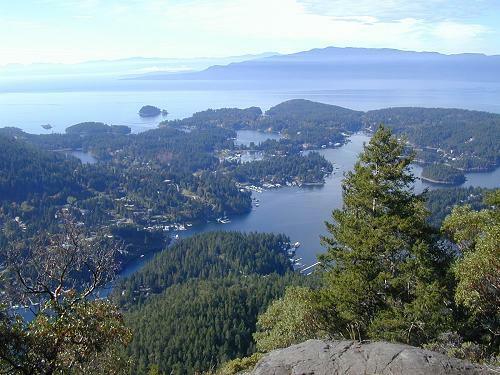 This is probably my favorite place in Desolation Sound. The boat traffic had really dropped off and this time we had the entire bay to ourselves. We did a swim, enjoyed the jellyfish, and hiked to the top of Llandover Mountain. Here is a photo Hoyt took of the moon jellyfish that inhabit this bay. They live here by the millions and are smart enough to avoid the tides that might sweep them out. 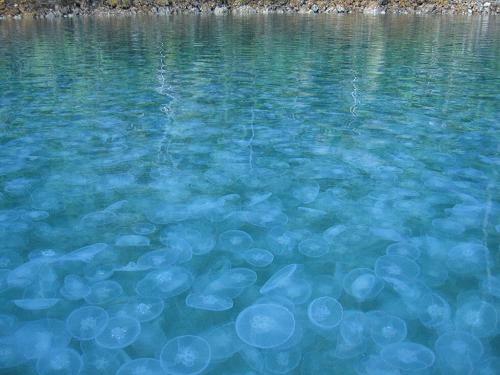 Although none of us swam through them, they do not sting (I tested them with my hand). I could spend an afternoon watching them pulse through the water. They look to me what I would imagine space creatures to look like. As anyone who has been crew on my boat for this trip knows, 5pm is happy hour with appetizers, drinks, and a relaxing pause to watch the sun start to set. This crew really knew how to do happy hour right with doubles for the price of singles on mixed drinks and appetizer specials all night long. After a quick 4 days, I dropped the crew back off in Lund and made my way south. 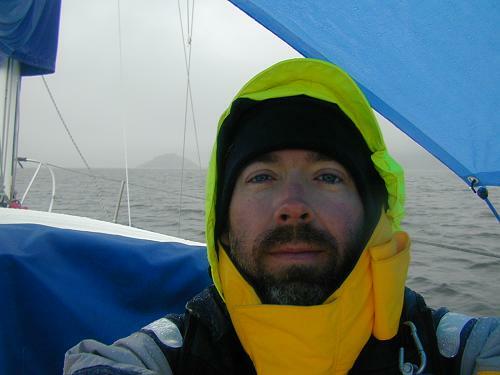 I had a week of solo sailing before I would meet Karen in Vancouver. Strong northwest winds helped me almost fly to Powell River for the night to re-provision then it was on to Ballet Bay at the inlet to Jervis Sound. The next place I stopped was Pender Harbor. I had a nice meal at the pub then the following day I did a hike to the top of Mount Daniel where I took this picture. Texada Island is in the distance. Heading south from Pender, I stopped for a night at Secret Cove then continued through Welcome Passage toward Howe Sound. At first the winds were fickle and the seas were oily (I love that term because it really describes the look of the water). Then the winds picked up from the northwest. 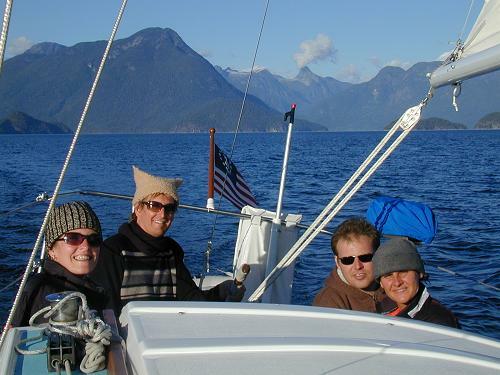 Once the winds picked up on my way to Gibson's Landing in Howe Sound, I put out the spinnaker and lowered the mainsail. I was able to make 5 knots in about 6-7 knots of wind. 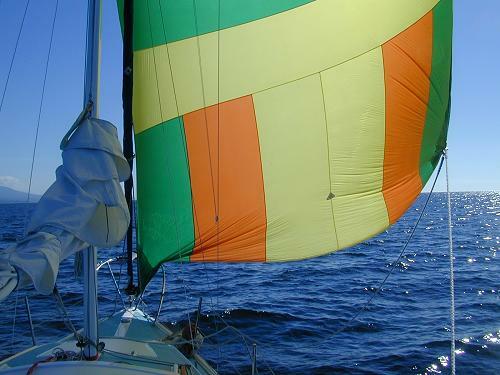 I have a symmetrical spinnaker but I fly it like an asymmetrical. My spinnaker should really be used with a pole with topping lift, etc. but it came with the boat and so I use it anyway. I have even come to like the Rasta colors in it. 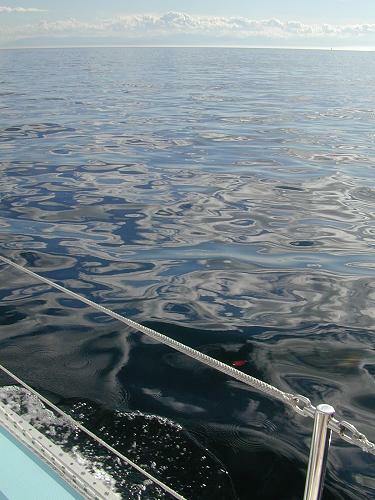 That day I laid back in the sun and listened to the sound of the water on the hull as the miles slid beneath my keel. Listening to the weather radio every day, I knew there was a storm system headed our way. It sounded nasty so I planned to wait out the worst of it in a place appropriately named Snug Cove on Bowen Island. 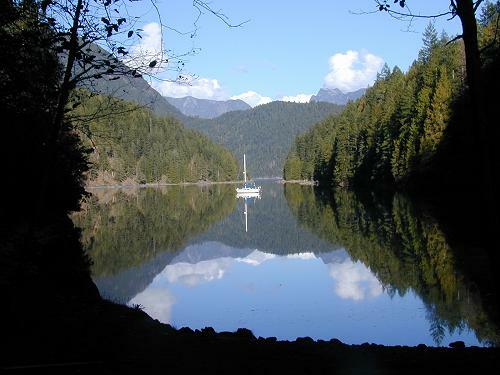 The previous night I was anchored further north in a place called Halket Bay where I listened to the rain drum on the cabin top all night. The sail to Snug Cove was wet but fairly mild. The winds really started picking up as I was tying to the dock in Snug Cove. There were small craft warnings (winds to 20-33 knots) just about everywhere with gale warnings (winds 34-47 knots) for the Strait of Georgia and storm warnings (winds in excess of 48 knots) for the coast. I hung things up to dry in the cabin, put on fresh clothes, and retired to the public library to catch up on email and write this post. Tonight I look forward to a meal and a pint in a warm pub and tomorrow I look forward to joining Karen in Vancouver.